Tis the season to be jolly and all that jazz – so drink and be merry folks! Now, to help you do said drinking and perform your merriment duties, I do have one remaining #RealTimeChem Week 2017 mug sitting forlornly in my desk draw. It looks a lot like this. Featureless white void not included. Imagine this, but with labcoats. …but I think the world of science has enough problems right now without all of us killing each other over novelty ceramics. Instead, there will be the next best thing: a Twitter poll! To populate this Twitter poll with options I would like to ask everyone in the community to nominate who they feel is the most deserving member of the #RealTimeChem community to win this glorious prize. This should be the person who’s contributions via #RealTimeChem have stood out to you most this year. Twitter Handle of the nominee. A brief reason why you are nominating them. A few examples of your favourite tweets from your nominee this year (optional but helpful). Nominations close on Friday 22nd December. The 4 most nominated #RealTimeChemists will be added to a poll on @RealTimeChem that will run until 1st January 2018. So, get nominating and happy holidays! Hello bloggers and blog readers! Livingston to Singapore – My Chemistry Story – by Craig Fraser (@chemistcraig) at Scottish Scientist in Singapore – A story of a chemistry life well lived from Craig. Humble beginning to big adventures around the world. An inspiring post for #RealTimeChem Week. Hydrogen Bonding and Electronegativity (or alternatively War and PAINS – by Peter Kenny (@pwk2013) at Molecular Design – some quite literal #ChemTogether in the form of a primer on hydrogen bonding and also a treatise on PAINS filters by way of War and Peace. Still working towards convergence in total synthesis – by Mark Peczuh (@mwpeczuh) at The Offset – some highly relevant observations regarding gender balance in natural product synthesis research that gathers a useful list of women working in the area. Thanks to everyone above for blogging this week. I’ll update this round up at the end of the week if there are any further blog posts. It’s almost that time again, time for #RealTimeChem Week! For those not in the know, #RealTimeChem Week is a 7 day event to help raise awareness of the #RealTimeChem chemistry community on Twitter and encourage as many chemists as possible to tweet about their chemistry. During the week various events, competitions and prizes are on offer, just to make it all the more fun and exciting. If you are completely new and want to know more about #RealTimeChem in general, then follow this link to the regular “About…” page, where you can learn all about the project and the community. Just tweet about chemistry using the hashtag #RealTimeChem. Simple as that. Well you can also use this year’s theme hashtag #ChemTogether. That will also be monitored by me during the event. Hell use both. Go wild. Just use one of these hashtags. The theme this year has, like in previous years, it’s own hashtag #ChemTogether – as chosen via poll by the community itself. Recent 21st Century history has made it feel like the world is tearing itself apart. Old wounds are being reopened. New ones are being cut. And those cuts, old and new, run deep. At times like this it can be difficult not to dwell on the negatives with so much hate, anger and fear in the world. –Gandalf, J. R. R. Tolkein, The Shadow of the past, The Fellowship of the Ring. What we have chosen to do with the time given to us, is study Chemistry. The central science. Molecules and their reactions. We are united in a common purpose to push the bounds of human knowledge and we’re going to have some fun while doing it. None of us can do this alone, we have our chemistry friends and colleagues, our fellowship, if you will. This #RealTimeChem Week is about bringing that fellowship closer together. To do chemistry together. 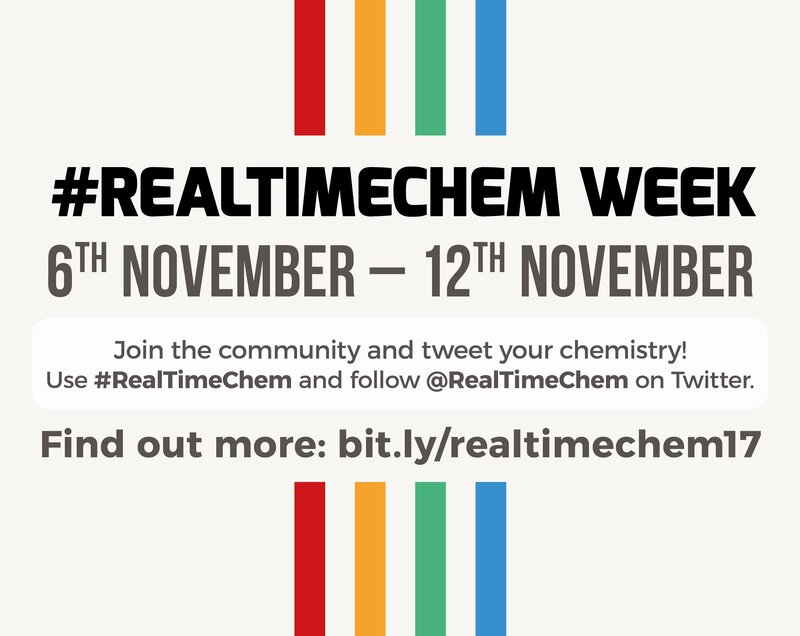 Below you will find some banners to help you share the word about #RealTimeChem Week 2017. Designed again by the awesome Andy Brunning of @compoundinterest (www.compoundchem.com). Just like previous years, I will be offering awards for the best tweets during #RealTimeChem Week. The format has radically changed this time. Most of these categories are intentionally broad and they hopefully cover the majority of areas that #RealTimeChem encompasses. So… to potentially win a prize in the awards all you have to do is tweet something within these categories using #RealTimeChem during the week. I’ll be keeping an eye on the hashtag and gathering up the best tweets with a summary of winners at the end of the week. There will be one winner per category and two honorable mentions as runners up (no prizes for these I’m afraid, except in the C&EN sponsored categories). Each winner (i.e. 8 of you) will receive the traditional, #RealTimeChem Week mug with this years #ChemTogether theme on it. Prizes winners will be announced on Wednesday 15th November. Winners will be asked to provide address details and then mug prizes will be sent out late November/early December. Update: New prizes from C&EN. Please note that cash prizes are only for US-based competitors. However, international entries are also eligible. Instead of a cash prize you will receive an Amazon gift card. Reminder that to enter in for a prize you simply need to tweet using the hashtag #RealTimeChem during the week and make sure that your tweet fits one of the categories. Best of luck! Now on its third year, The Great #RealTimeChem Cook Off celebrates the perfect combination that is chemistry and cooking. This years goodies to be won! The competition only takes place on the weekend of #RealTimeChem Week. Feel free to cook something during the week, but the tweet must be shared on the weekend of November 11th-12th to count. Update: Additional prize! Matt Hartings (@sciencegeist) has kindly offered one winner a signed copy of his book “Chemistry In Your Kitchen” as a prize. This will be awarded to the very best Cook Off tweet of the weekend. Previously, #RealTimeChem Week 2015 had a “Back to the Future” theme, resulting in some fantastic posts on #OldTimeChem and #FutureTimeChem (highlights are available here at SciTechConnect). #RealTimeChem Week 2016 was focused on “New elements in chemistry” (#NewElemChem) which focused on a range of topics about new experiences in the blogger’s chemical lives (round ups here and here at SciTechConnect). Write a blog post telling a story in your life as a chemist where you have collaborated with another chemist (or chemists!). This could be the story of how a recent research paper came into being, a daring tale of an adventure you had attending a chemistry conference or a personal narrative about how chemists are the most fun people at parties. You could answer that long standing question; what should a group of chemists be called anyway? You could blog about how chemists do things together periodically – like we haven’t heard that joke before. This is your story. Let us know how you #ChemTogether. So, if you are a blogger, write a post and share it during the Week on Twitter using the hastag #ChemTogether. The carnival this year is being hosted here on Doctor Galactic & The Labcoat Cowboy. I will be looking out for this hashtag and will collect your blog post into round ups (2-3 times in the week depending on numbers) so they are all in one place for easy access. Logo © 2017 The Royal Australian Chemical Institute Incorporated. A fantastic opportunity to own a piece of history and also help raise money for an amazing charity in East Anglia. To learn more about the vital work of EACH please click here. More information can be found in Kit’s Tweets below. Also check out the auction page on eBay itself here.